ArmInfo.In the current political situation in Armenia, it is necessary to constantly be in dialogue. 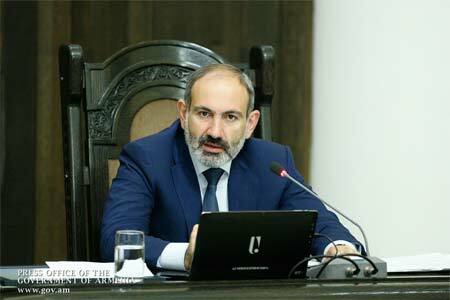 On this October 16, during a meeting with representatives of the ARF "Dashnaktsutyun" party, RA Prime Minister Nikol Pashinyan said. "I highly appreciate this dialogue, and I want to say that I highly appreciate the role and activities of ARFD in our modern life. I hope that our conversations, political processes and the political situation will continue in the logic of continued cooperation, and, of course, we are ready to do everything possible for this, "said Nikol Pashinyan, whose words are quoted by the press service of the RA government. The Prime Minister expressed confidence that the approaches of ARFD coincide with his position. "We have to discuss problems on a regular basis, I'm not saying that there will be no problems, this is generally a bad mode of operation for any democratic country, we just need to hope that any problems can be discussed on the basis of facts, dialogue, ETA's political situation, the country and the interests of the nation, from the point of view of the interests of the people ", - said the RA Prime Minister. In turn, the representative of ARFD Armen Rustamyan noted that regardless of the outcome of the development of political processes, the party has its clear ideology and its political positions that will not change. "We are confident that the dialogue should be continued in the name of the country and the state," said Armen Rustamyan, adding that in this context the assistance from the ARFD has always been and will be. "Of course, it is very important that at this stage all problems are solved in an atmosphere of mutual respect, the ability to listen to each other's visions, since healthy cooperation also presupposes discussions on some issues, and why not, debate," appreciated the results of the revolution that took place in Armenia. "We believe that a revolution consists of stages that must be passed. For us, the stage of denial is also important because it implies a refusal to return to the same shortcomings and mistakes. It is necessary to regroup and go to fast construction, and there you can always hope for our assistance." , - stressed the representative of the party ARFD. During the meeting, issues related to the current political situation in Armenia were discussed.